Added 30 September 2016: Latest updates and order information available at http://debbiewayne.com/ggip/index.php. 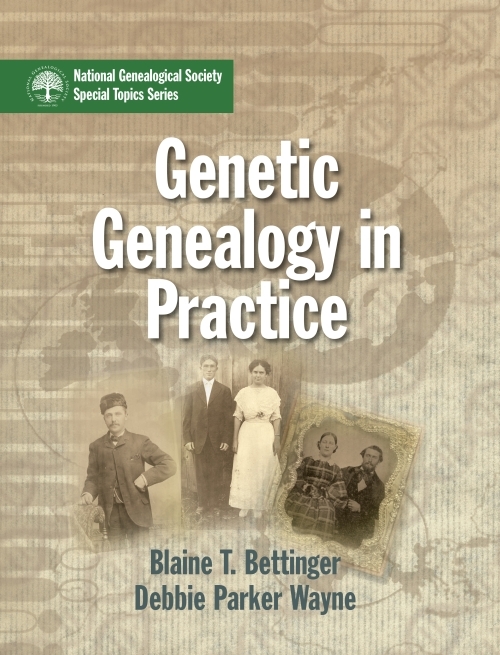 We are getting questions about the contents of the newly-released book Genetic Genealogy in Practice written by Blaine and me (not to be confused with the book Blaine wrote alone1). Genetic Genealogy in Practice is only available at this time from the National Genealogical Society (NGS) (not on Amazon yet). How Much DNA Evidence is Needed? 1. Blaine's book written alone is The Family Tree Guide to DNA Testing and Genetic Genealogy available at http://www.shopfamilytree.com/guide-to-dna-testing-and-genetic-genealogy. Blaine says, "the Family Tree Guide is better suited for people who have no DNA experience, while the NGS book, Genetic Genealogy in Practice, is better suited for people who want to gauge and expand their DNA knowledge." Debbie Parker Wayne, "'Genetic Genealogy in Practice' topics and sub-topics," Deb's Delvings, 12 September 2016 (http://debsdelvings.blogspot.com/ : accessed [date]). Sounds promising. Thank you for posting the contents. You are welcome, Trish. 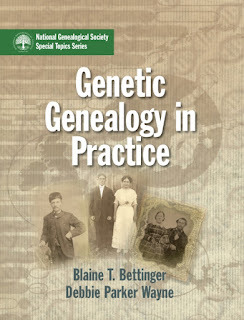 Blaine and I hope readers find the book useful for learning more about genetic genealogy. "Genetic Genealogy in Practice" is HERE!